In March of 2013, I was shopping with my then-4 year-old son. He saw some Thomas the Train fabric and asked if I would make him quilt. I had no idea how to sew, but I would do anything for my boy! I bought a $10 sewing machine from Big Lots to go with the Thomas fabric and after learning to sew by making un-paper towels, I made my very first quilt. At the time, Marissa, our Dutch exchange student was living with us, so I made her a quilt, too. Sometime toward the end of the first quilt, I decided I liked quilting, so I upgraded to a Singer Curvy. 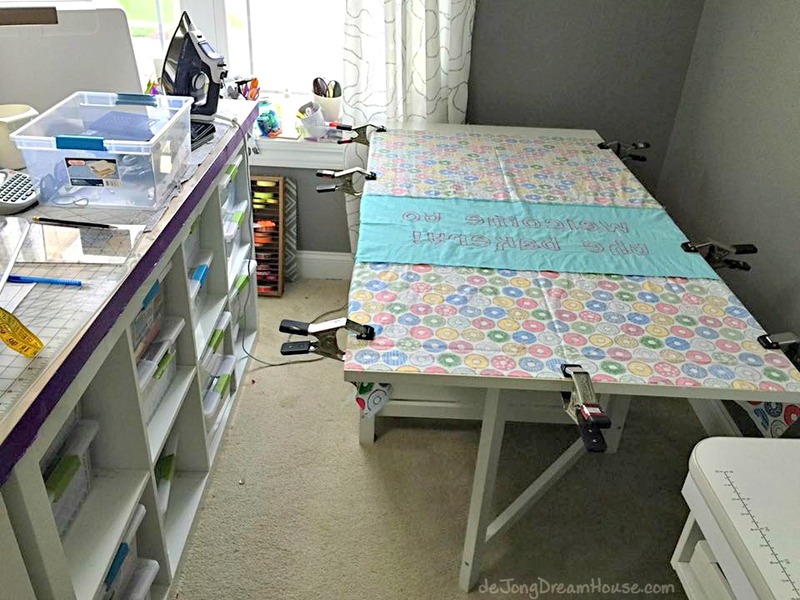 Like a lot of quilters, I used our dining table for my sewing area. We eat together every night, so I quickly tired of moving my things every day. I started storing my supplies and stash in deep Sterilite clip boxes, which made moving and storing easier, but I discovered I needed more and more boxes...and a dedicated craft space. By the time Marissa returned to the Netherlands, I had finished my third quilt and was nearly done with my fourth! We were all pretty sad to see her go. My only consolation was that her room would be empty and I called dibs! The day we dropped Marissa off at the airport, we went immediately to IKEA to pick up supplies for an IKEA hack idea I had. Our DIY craft table tutorial is our most popular post in the history of de Jong Dream House! Since moving in to my craft room 3 years ago, I have made 64 quilts and have made countless tweaks to my craft room as I learned new techniques, discovered new tools and notions, and of course, built up my stash! About a month ago, I bought a free motion extension table to expand my quilting beyond straight lines. So I bought a table to go with it. Which meant my big comfy chair needed to go. Which meant I needed to re-organize everything. Are you ready? Welcome to my happy place! Hanging on the outside of the door I have my small design wall, inspired by my friend Nicole. I took glass out of frame, cut a piece of batting the size of the glass, sprayed adhesive to the back of the frame and smoothed the batting over it. For the time being, I use this one to hold my scrappy yo yos...which I will make into a quilt...someday. View from the door. The room itself is 12' x 12', so a typical bedroom size. I still drool along with everyone else when I see the big beautiful studios and She Sheds. As I mentioned already, I wrote a tutorial for the craft table a few years back. If you read that post, you'll see how the room has changed in the last three years! 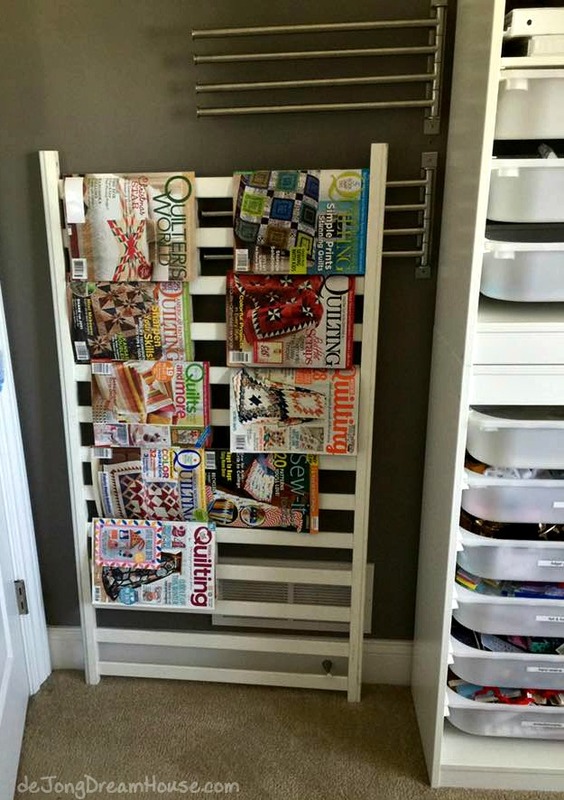 Behind the door I have re-purposed a crib as a magazine holder. I have more books and magazines in the closet, but these are either new issues or have a specific pattern I want to find quickly. The metal bars are a IKEA Grundtal towel holder. In the early days I used to hang fabric and rows of pieced fabric. 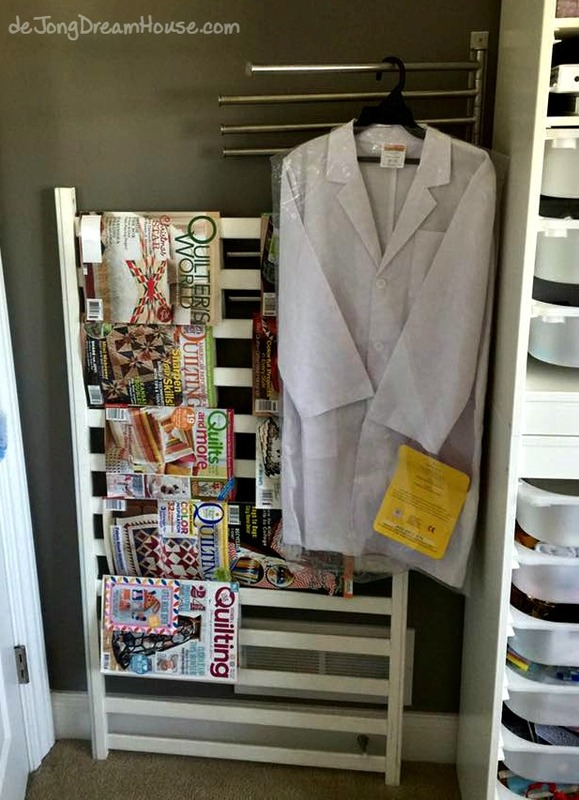 I still use it for that sometimes, but I also use it to hang things like my son's new lab coat that needs patches put on before Space Camp and completed applique shirts. Moving down, this is what I call my Trofast towers. The middle three hold fabric scraps sorted by color. 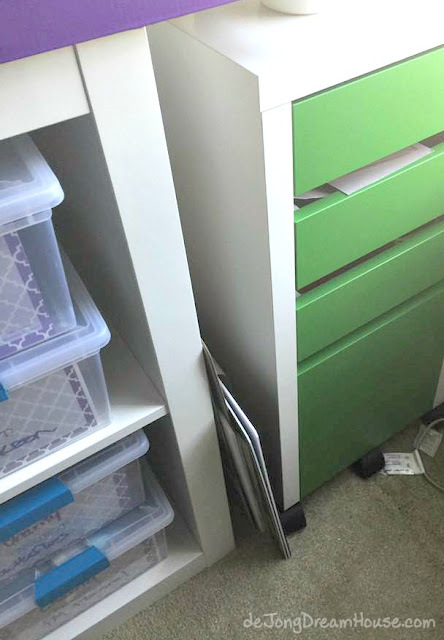 On the sides I have things like Command products, rick rack, laminating products, Silhouette supplies, writing utensils, etc. 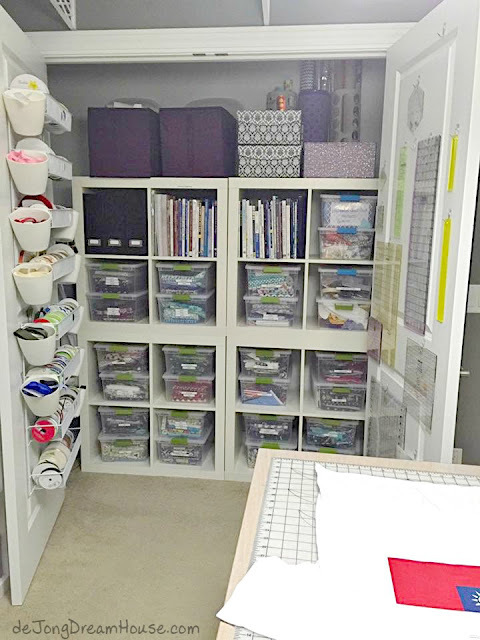 The bins on top were found on clearance at Target and include terry, t-shirts, batting, and baby items ready for applique. The purple baskets include patterns. On the wall by the curtain are two Vurm wine racks from IKEA (of course) that hold my Heat N Bond Lite, quilting paper, stabilizer, freezer paper, printable fabric, etc. 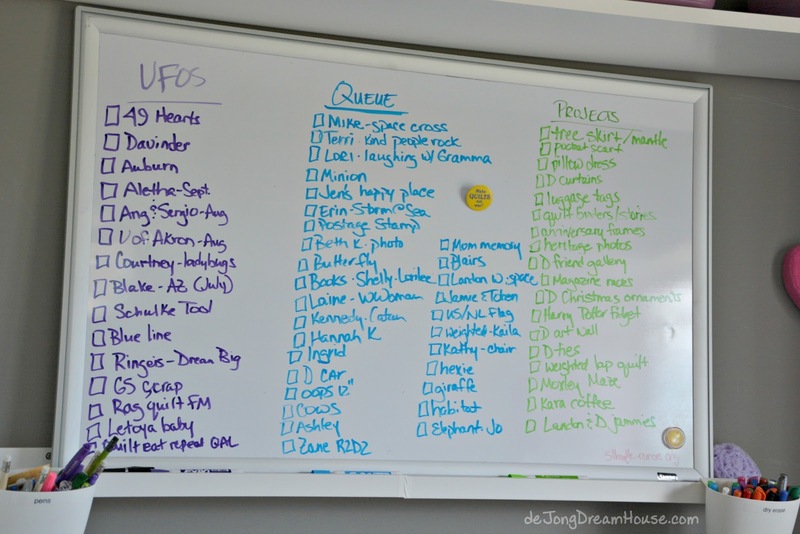 The white board lists my current projects, to do queue, and other craft projects. This post reminded me to update it. Much prettier! Moving to the craft table, on the Trofast side, I keep all of my tonal prints in deep Sterilite clip boxes. I put purple duct tape along the unfinished sides of the table top so I won't snag fabric on it. It's held up pretty great for three years, but I'm thinking about putting something new on it and then marking inches with my Sharpie. Between the craft table and the window, I have a Sterilite Touch Can to hold my teeny tiny scraps. I keep a garbage bag in the can so when it fills up, I can easily keep everything together. I use the scraps for stuffing and occasionally, for tiny applique pieces. On the other end of the craft table, I have clip boxes for my neutrals, muslin, and solids. On the sewing side of my craft table, I have my UFOs. Each clip box includes a laminated project label with the recipient and description of the project. When I start think of a project, I get a bin and start putting in pattern (or patterns, if I'm not sure yet), fabric from my stash, and anything else that might go along with it. In the slot between the craft table and the IKEA Micke drawer unit re-purposed from an old desk, I keep my rotating cutting mat, pressing mat, some poster board and any oversized things I need to tuck away. I love IKEA Bygel containers for storing little things. They're only 99 cents each! I keep my cutters, scissors, and tape measures on a this little file cabinet. The empty one is used for scraps when I'm cutting and trimming. Do not leave your rotary cutter open when moving it to take a picture. This is not smart. In the top drawer of the cabinet has my blade sharpener, precision cutter, chenille cutter, circle cutter, press perfect, and other cutting supplies. 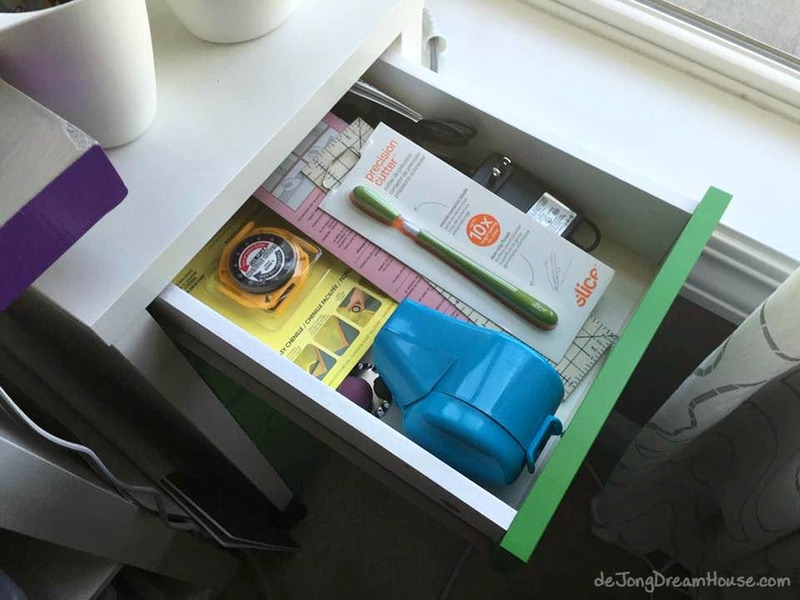 Other drawers (not pictured) have fat quarter cardboard and my hexie punch, and decorative scissors. Turning around, here's the sewing area. The table in the corner is my free motion area (or friend area, when I have a sewing date!). I am just starting to learn how to free motion. I've been eyeing a sit down quilting machine for awhile now, but when I saw the Sew Steady Free Motion table, I knew that it was just what I needed. I can use my regular Pfaff for free motion. I bought a Norden Gateleg table from IKEA to support it. And I love my purple saddle chair. It's super comfortable! The nice think about the table is that if I move things around, I can use it to sandwich my quilts. Tucked in the back is my Rubbermaid EZ Step Folding Stool. My Pfaff sits in a Janome Universal Table I bought used from a local Amish shop. I bought the bungee chair from the Container Store before our house was even finished! In between the two tables is a Honeywell QuietSet fan that I LOVE in the summer when my iron heats up the room! Above the sewing table I have two Ribba picture ledges (the Ribba has been discontinued and replaced with the Mosslanda line). 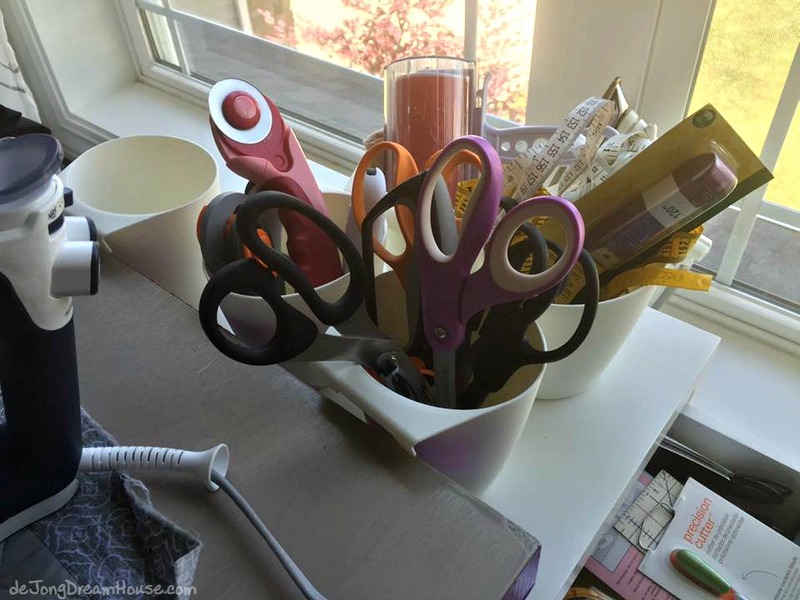 I use the Bygel containers to hold little things like safety pins, straight pins, clover clips, T-pins, quilting gloves, cheater glasses, seam rippers etc. 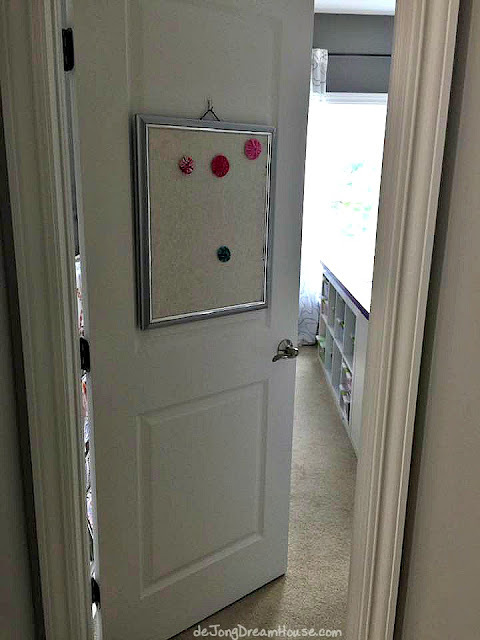 On the closet doors I have two medium design walls made the same way as the one on my main door. 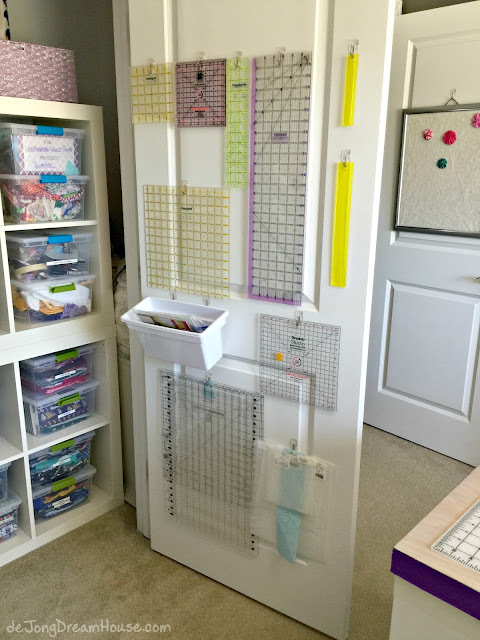 When I converted the bedroom into my craft room, I removed the closet shelf and installed it on the wall outside the closet. I use it to store rarely-used things. What I use more is the rod with clip hooks to display finished tops and quilts. Looking inside the closet. Ribbon storage on the left door. Ruler storage on the right door. More IKEA Expedit/Kallax inside to hold my prints, books, magazines, batting scraps (in the large purple bins), fat quarters (in the black & white boxes), and extra binding (in the purple basket). I tried a LOT of different ways to store ribbon.I wanted something neat, where I could see everything at once. I also wanted to be able to put individual rolls out, so that ruled out options where the rolls were hung on a holder. I used more Bygel bins for loose ribbon, sorted by color. The racks themselves are Style Selections coated wire shelves from Lowe's. I have two stacked and hung with Command hooks. And finally, I have my rulers hanging on the inside of the closet door, once again using Command hooks. In my dream world, IKEA, Command, and Sterilite would ask me to be a product tester! 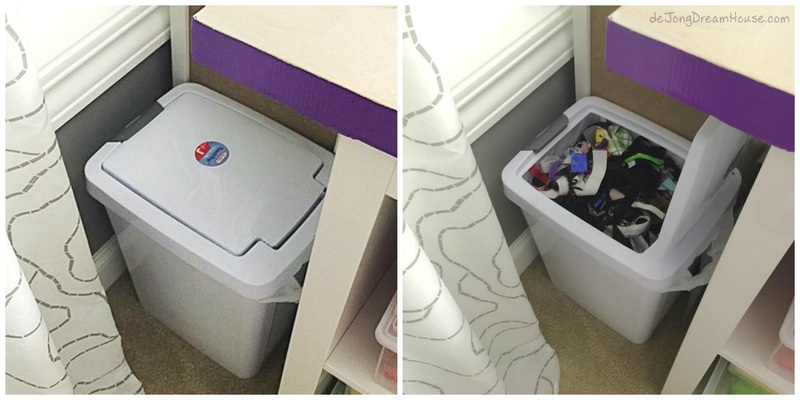 The bin that sticks out from the door is actually a $1.64 ice bin from Walmart. I tried all sorts of much more expensive options for my smaller templates and rulers, but this worked the best. If I had a lot of patterns, I could see using these to store them. Can't beat the price. Whew! That's the tour, folks! I hope you enjoyed looking around and found some ideas you can use. I tried to cover everything, but if I missed something or if you have questions, leave a note in the comments. Thanks! 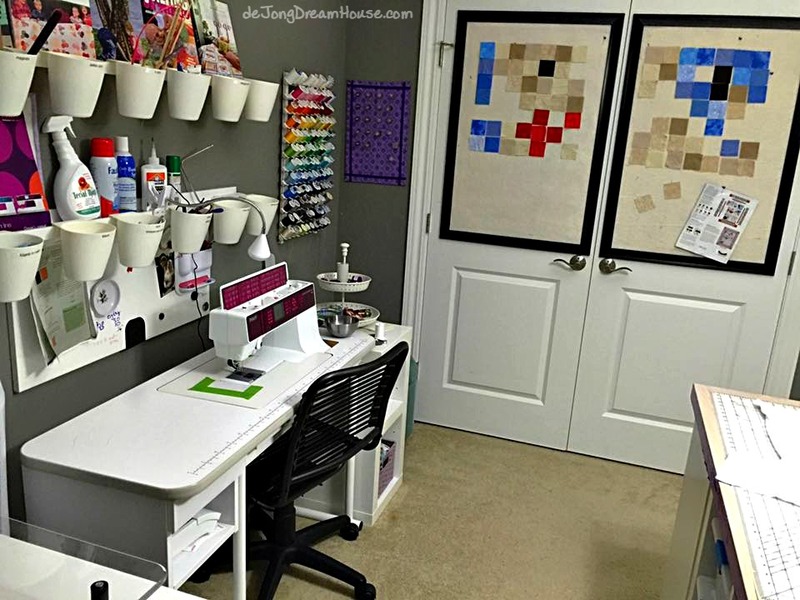 Wow, what a great sewing room! 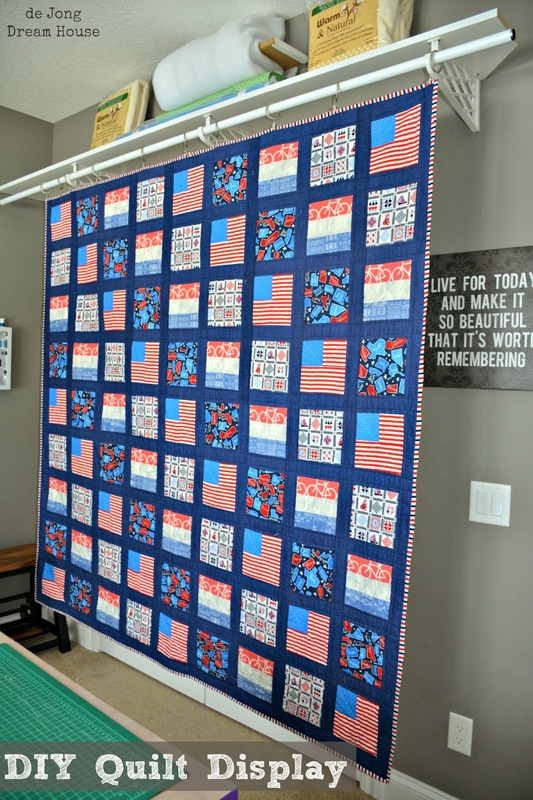 You have made 64 quilts in only 3 years?!!! Impressive! I really like your white board for keeping track of where you are and what needs to be done with your various projects. How could I be the first one to comment? 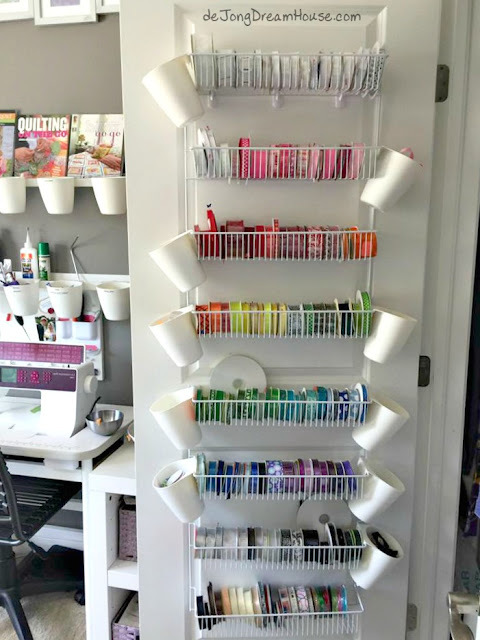 This craft room is awesome!!! A gold mine for any quilter or DIY girl.... Love this! lol! Thanks, Jen! I'm sure there will be others. I just posted last night! Nice. 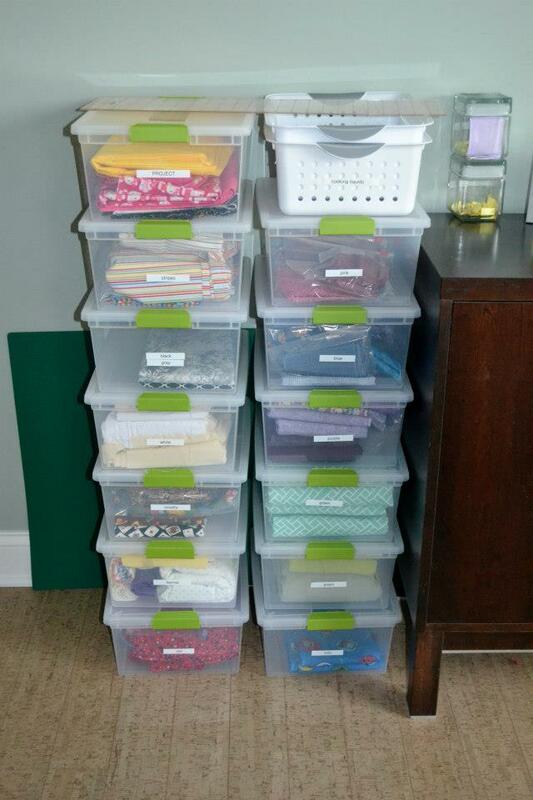 This is so clean and organized! 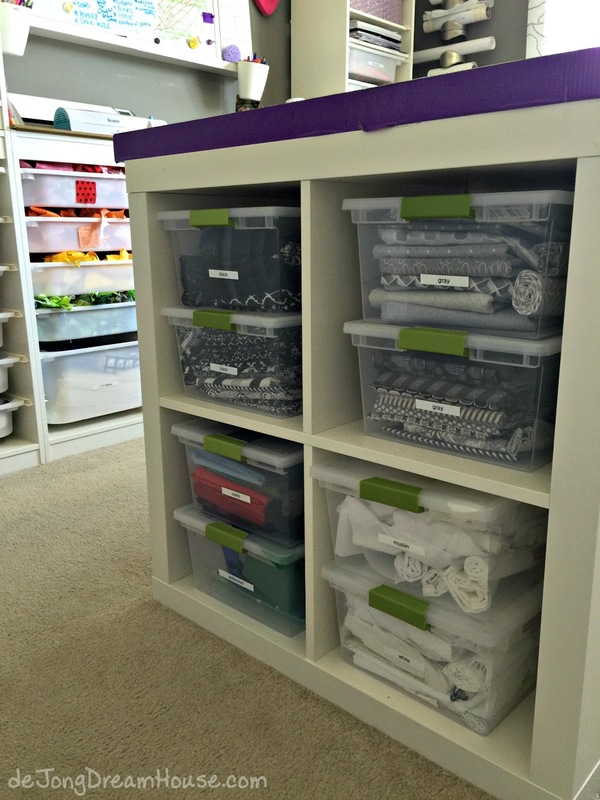 I love your craft room. It looks like you have a lot of room to create all day! 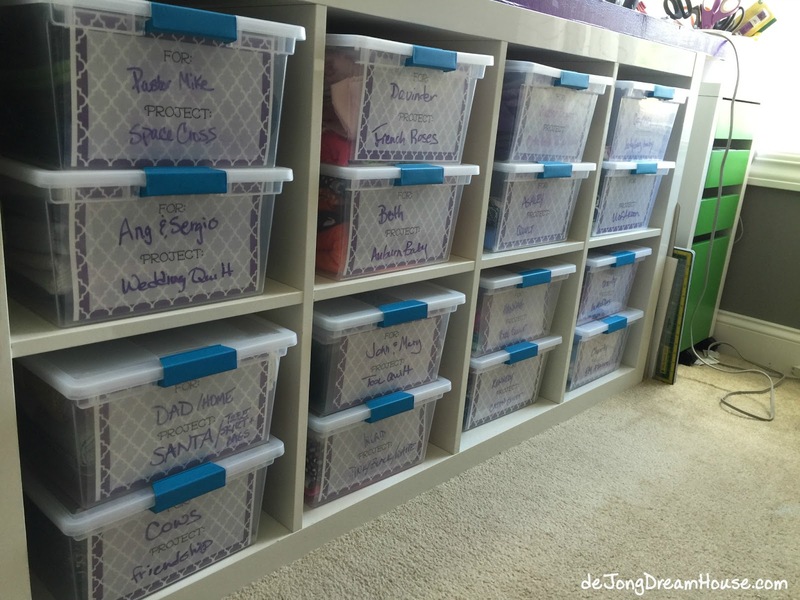 You are one organized lady! And prolific too! 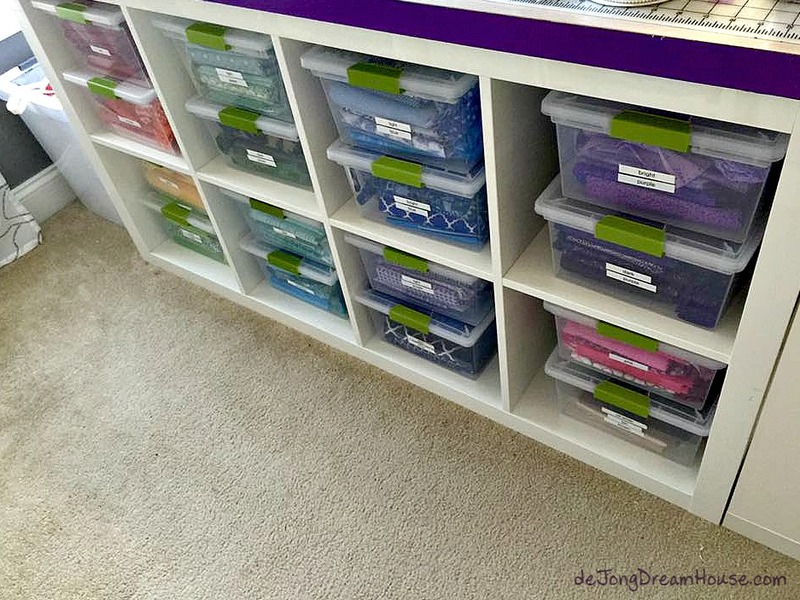 :) I really like the way you store ribbons. Perfectly viewable and able to get at when needed. You have lots of great ideas in just this one post! Oh my gosh! You must be in seventh heaven with that sewing room. 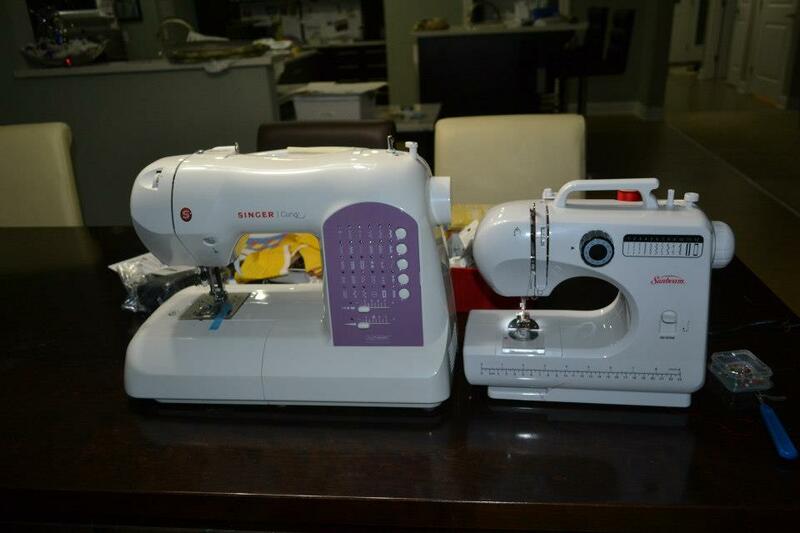 Wow--I though I was happy with my sewing world, but now I'm in a jealous place for sure. Lots of great ideas though. Thanks for sharing. I am so jealous! I'm the one who quilts at my dining table and clears it off every night for dinner! 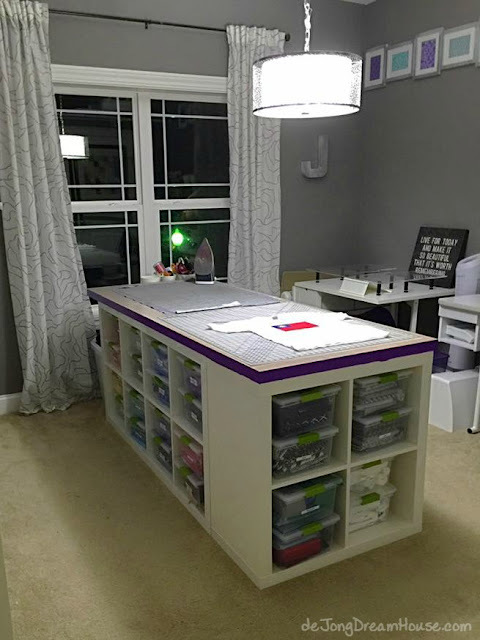 I've dreamt of a dedicated sewing room! If I had a room, it would look like yours! Wow. What an amazing room! Thank you so much for sharing your space with us. I am slowly turning my bedroom into a sewing room with a bed in it. 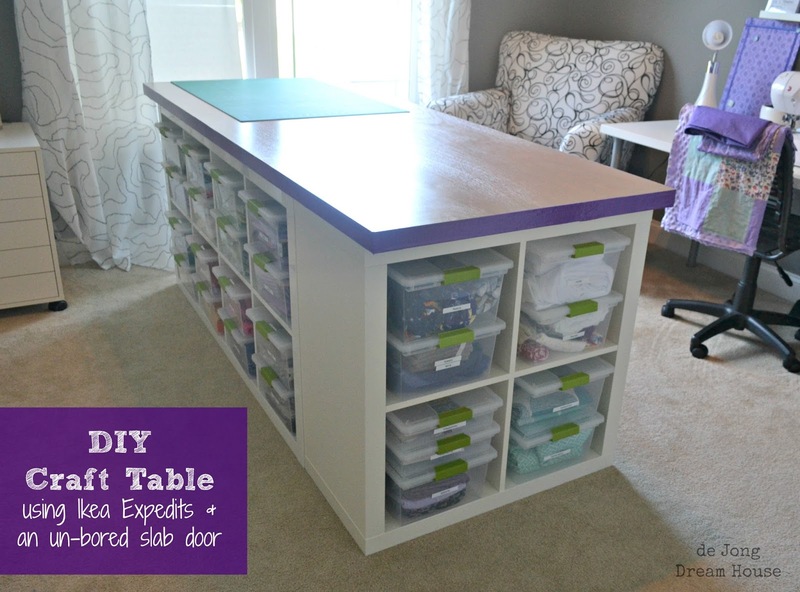 :) The storage shelves under all of the tables is a great way to go. Also, using your wall space like that is excellent! It looks so pretty. 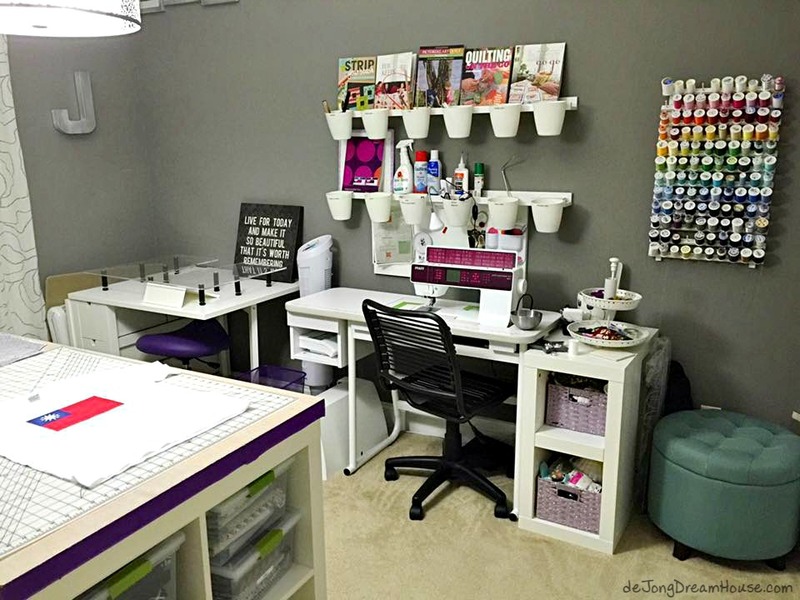 What a beautiful sewing room. Looking at your pictures, all I could think about was my mom and how she would have loved to have had a room like this with everything at her fingertips. I never quite developed the love for sewing that she had but I can appreciate your beautiful room. Thank you for sharing your lovely space. So well organized! Want to come to my house? 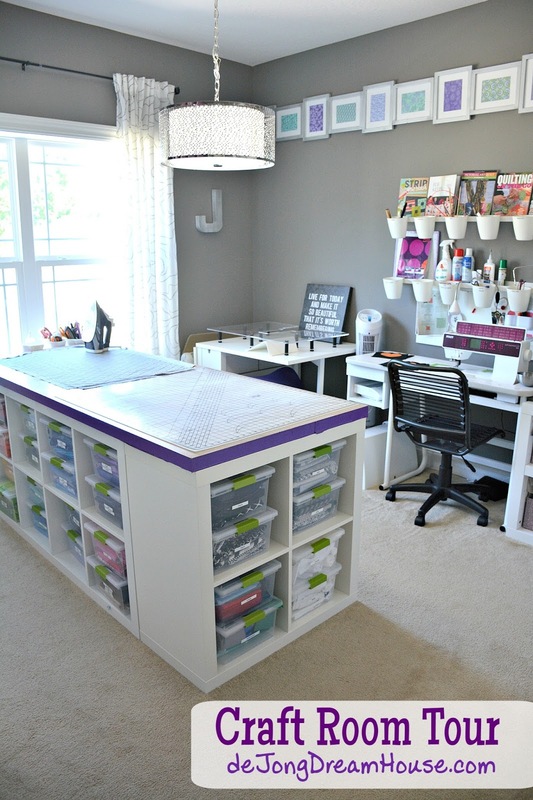 Jen, I thoroughly enjoyed the tour of your craft room. I can't believe it's only a 12x12! You use your space very efficiently! I'm sure IKEA, Command, and Sterilite will be calling any day and you'll be living your dream. Good providence w/the FMQ. Thanks for linking up at WHOOMP There IT Is! Please come again! WOW, I want a room like yours! Wish I had seen it before I started buying shelves and tables that have been placed wherever I found room. Your tour gave me ideas on getting all the mis-matched pieces together for a more pleasing place to create. Thank You! Amazing! I've never seen such a creative, clean, and great looking organized room. What do you do with all your projects? Do you sell what you make or are they all gifts? I would have a difficult time starting so many projects and going back and forth to them. But that must help to keep things interesting and not boring. I feel if I don't complete something before I start another project it will never get done. I commend you! Thank you so much for sharing! I love the organized, peaceful place that you have designed. What an amazing place to see! Absolutely incredible!!! 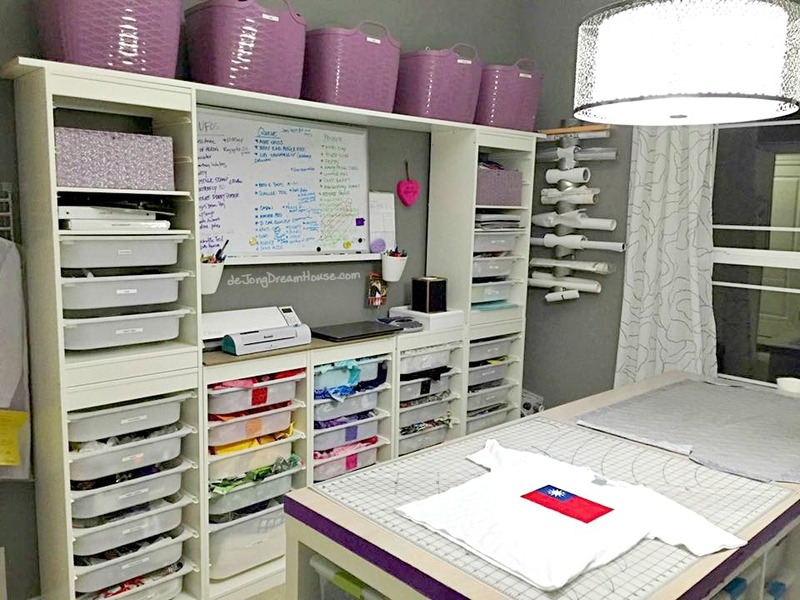 I have been searching for months for an inspirational and doable way to organize my new craftroom...and now I have found it!! If I could just get the hubby to detour his thinking of my craft room is the last room we're remodeling lol! !